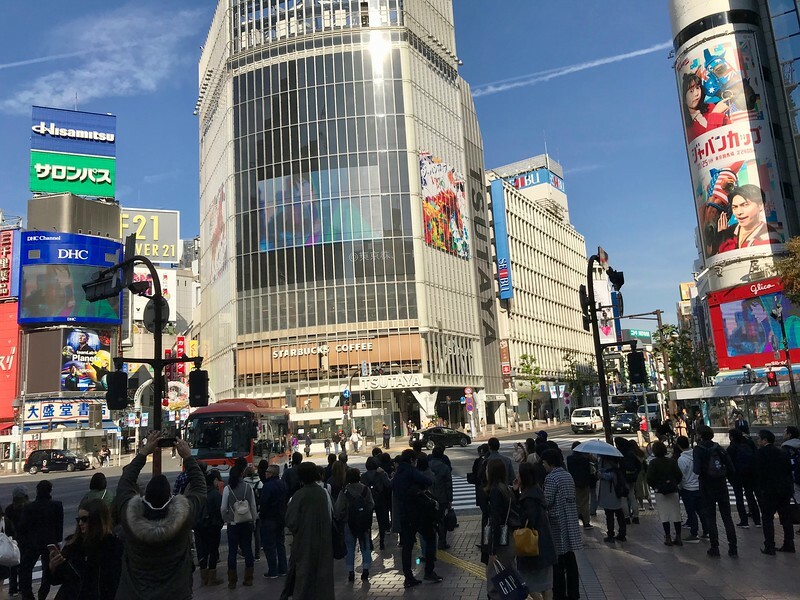 Tokyo is a large city so you can save some money on getting around and some of your precious vacation time by organizing your trip before you go. 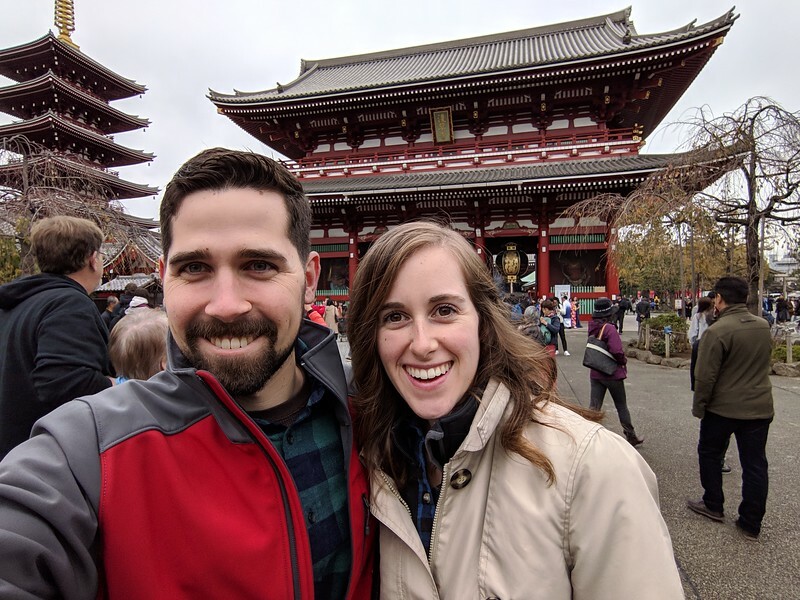 Let me suggest a Tokyo Itinerary in 3 days (or 4 or 5 days) based on our last family trip to Tokyo. We start by splitting the city into east and west and started by tackling the western part of the Yamanote Line which is the railroad loop line in central Tokyo. We started our trip with a private guided tour with Maddy from CityUnscripted. CityUnscripted had offered us a tour and we find that when we start our trip by spending time with a local we can get more out of it. This can be a great way to get oriented to a country, especially a country like Japan where some of the customs, language and religion can seem quite foreign. We met Maddy outside the Shibuya subway station at the famous Shibuya Crossing, which I first saw in the movie “Lost In Translation”. It does seem odd that a busy crosswalk would be a popular tourist destination. One thing that has changed since my last visit here is that there is now an observation platform on the roof of the 109 Men’s store. The platform was free during our visit but the expectation is that there will be a fee sometime in the future. Right outside the subway is another photo spot which is the Hachikō Statue. This is the famous dog who always waited faithfully for his master to come home via the subway that was made into the American movie “Hachi: A Dog’s Tale”. 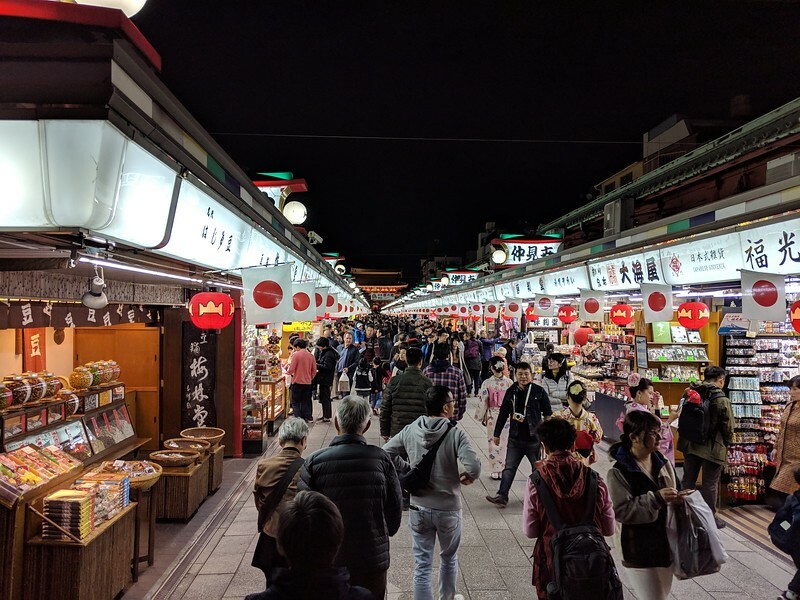 We took a quick walk through Omoide Yokocho (aka Piss Alley) which is a couple of blocks of small bars and food stalls near the west gate of Shinjuku station.When I say small I mean like 6 people at a time small. The area is lively at night but deserted in the morning. 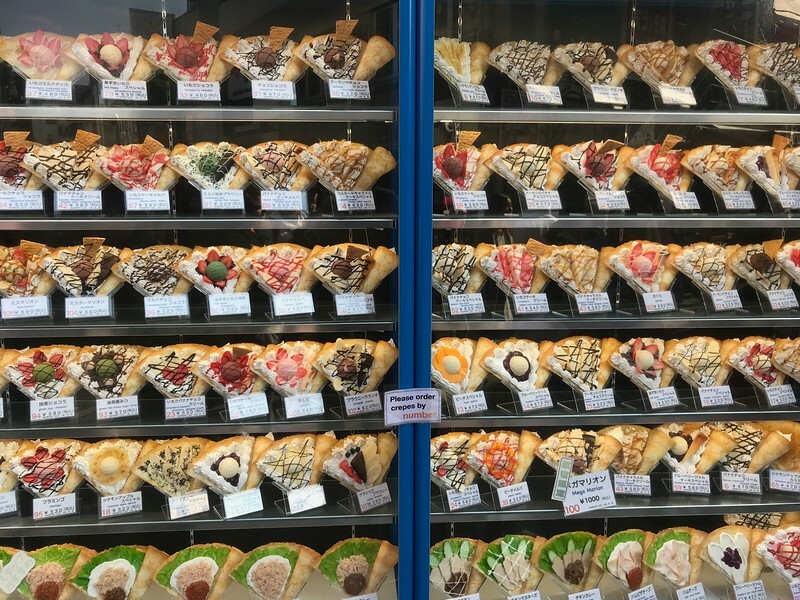 What is open and worth a stop is the basement of the Tokyu Food Show and its amazing collection of food counters. You can pick up something for lunch or grab a late breakfast here. Also worth noting is in the Japanese food culture you can pay an amazing amount of money for food of exceptional quality. 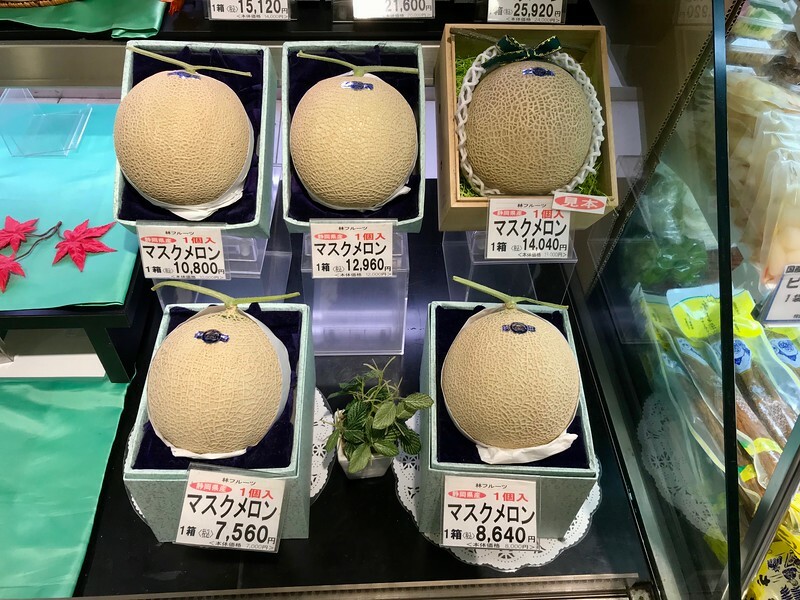 One stall, for instance, had a cantaloupe suitable for giving as a gift that cost 14,040 yen or around $129. From Shibuya get on the JR train to Harajuku station (2min ¥140) for a visit to the Meiji Jingu Shrine. This shrine is dedicated to emperor Meiji who wrested control back from the Shogun in 1868 after over 2 and a half centuries of Shogun rule of Japan. Emperor Meiji then led the modernization of Japan. Japan would be a very different country without this ruler. 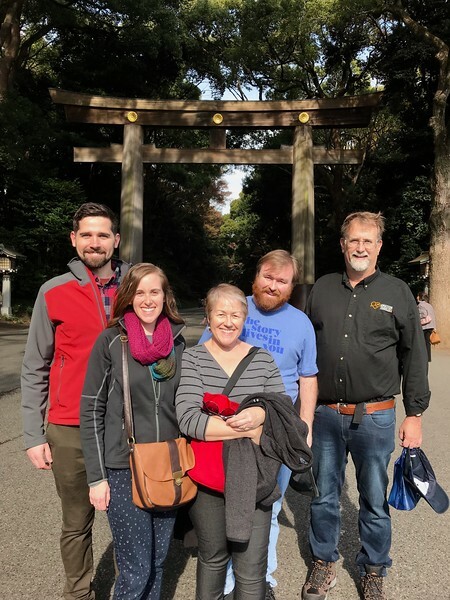 Visiting your first Shinto shrine is one of those times when it is particularly helpful to have a local guide. Maddy told us of the history of the shrine and explained what was going on. 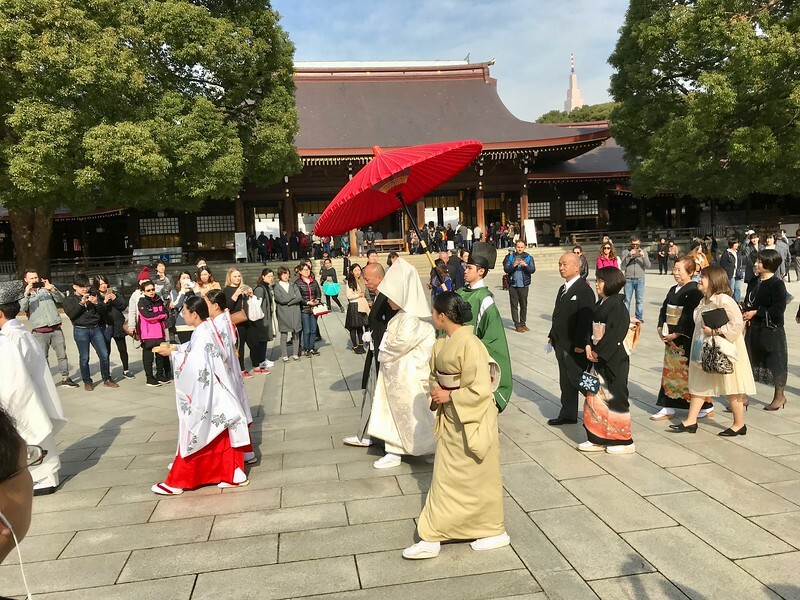 She showed us, for example, how to use the water at the entrance of the shrine to ceremonially wash: wash the left hand, then the right, then your lips and then the handle of the water dipper itself. Another protocol thing to know include don’t walk thru the middle of a tori gate which is reserved for deity… which you are not. There happened to be a wedding going on at the shrine when we were there. This is an active place of worship, so behave accordingly. Although “accordingly” took on a strange twist when Maddy pointed out a great number of small dents in the wood of the front of the temple. On the Hatsumode holiday (the first 3 days of the new year) the crowd at the temple sometimes got so deep that people throw offerings of money from the back of the crowd. Huh. Nowadays they put a giant swimming pool-like place in front of the main hall as a money offertory box for Hatsumode. Opposite the Harajuku station is one of the prototypical Japanese pedestrian streets. 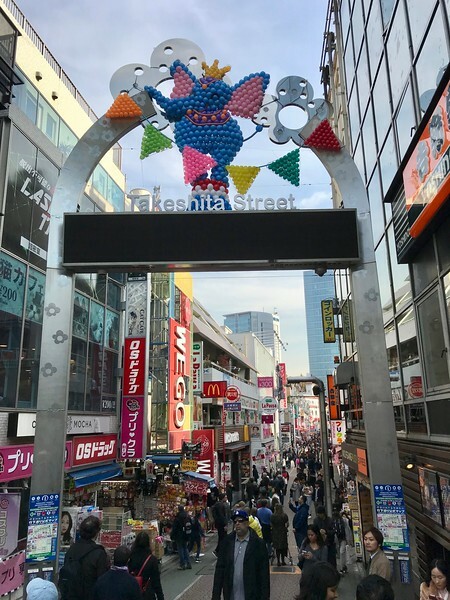 Takeshita Street has a number of small shops carrying different clothing styles as well as chain stores, touristy shops and places selling imaginative ice cream or crepes. Maddy grew up outside of Tokyo and when she could come into the city as a teenager, this is where she came. If you are interested in shopping Nonbei Yokocho street is nearby and is a treelined street with high-end shops. 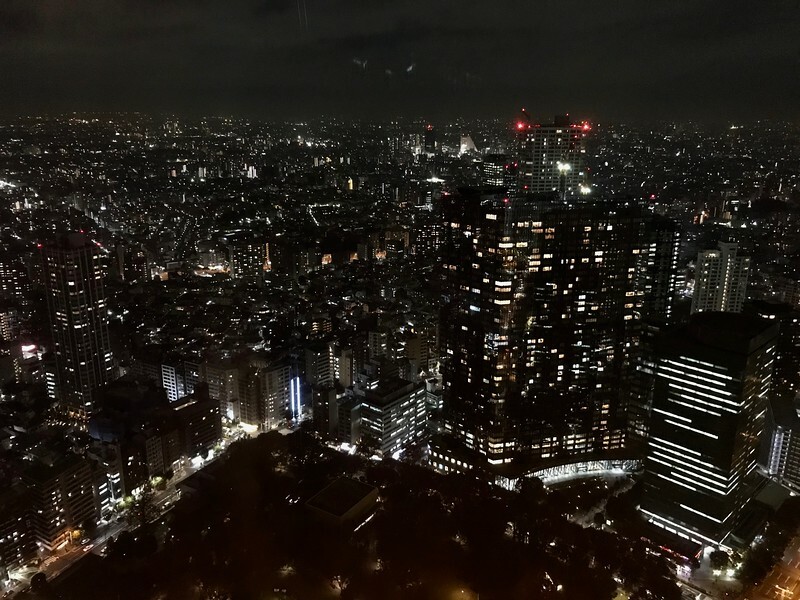 For a great view of Tokyo you can go up Tokyo Tower or the Sky Tree or you can get a view for from the Metropolitan Government Building which is near the Shinjuku station north of Harajuku. There are two observation decks on the 45th floor, one in the north tower and one in the south. The north tower also has a restaurant on the 45th floor. There is a government workers cafeteria on the 32nd floor of the north tower where you can go for a good inexpensive meal if you are willing to deal with choosing your meal from a vending machine in Japanese. 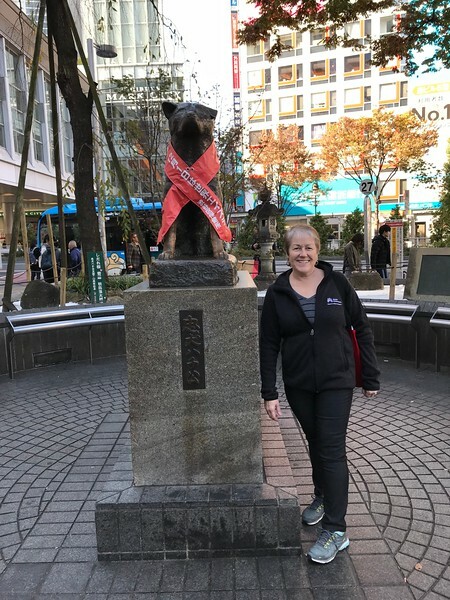 On day 2 we focused on the more western side of the main loop, starting in Asakusa. Our destination was the Sensoji Temple, but on the way we wound our way through the Nakamise shopping street in front of it. This is an interesting area for shopping, enough so that we came back again later in our trip to spend more time in the various stores as well as the shopping from here to the Asakusa subways station. This is a pretty good area for buying souvenirs but also trying some street food, sampling some good Ramen, or finding some bargains. It feels like every time we looked up some spot in a guidebook it recommended that in front you could find a shopping / dining street, but this was one of our favorites. We came back to this area for lunch at Ippudo ramen which is a chain, but one of the top rated Ramen places in Tokyo on TripAdvisor. Add my vote as well. Ramen on a day threatening rain is just about perfection. Much of ancient Tokyo was destroyed by fire over the years, including fires started by the USA when it was bombed in WWII, so you won’t find a lot of ancient buildings from the ancient Edo period. The original Sensoji Temple was built starting in 645 AD but the current one is a re-creation built after WWII. This is a busy place. 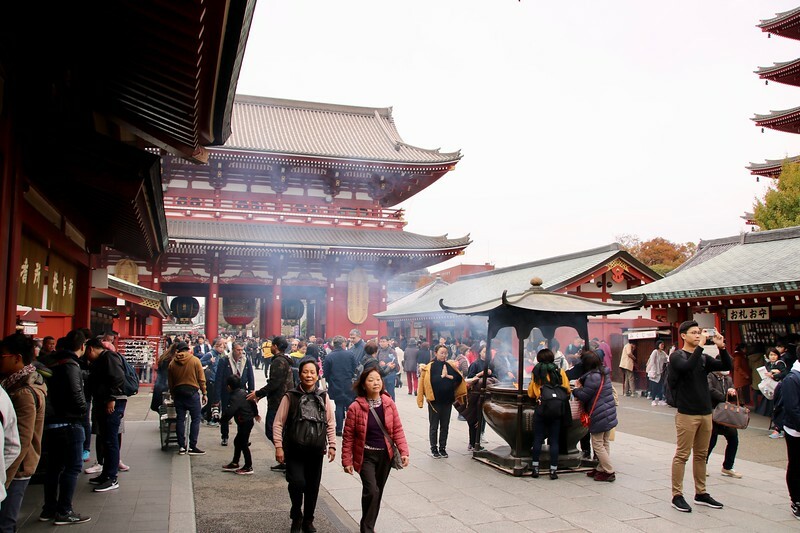 It is filled with the smell of incense, tourists and a surprising number of people in kimonos. I was going to write that if you don’t appreciate crowds then Sensoji is not the right place for you, but perhaps Tokyo itself is not the right place for you. 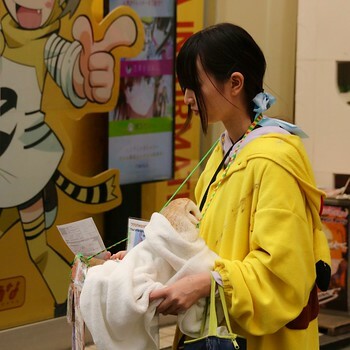 Many visitors will donate 100 yen to get guidance from the divine oracle for their future, but we knew that our future held ramen so we had no need. If you head from Sensoji to the west you will come to the Sumida River. There is a small park along the banks of the river on the east side including a monument to the Great Tokyo Air Raid that destroyed the Sensoji Temple. Right by the red bridge on the Sumida River are the ferries that can take you to Odaiba later in your trip. If you have time, there are nice views of the river back towards Asakusa from the Asahi Beer Headquarter Building on the west side of the river. You can recognize the building by their stylized gold flame on the top. There is a bar on the 22nd floor of the building with some good views. Non-smokers should visit before 5:30pm because smoking is permitted after that time. 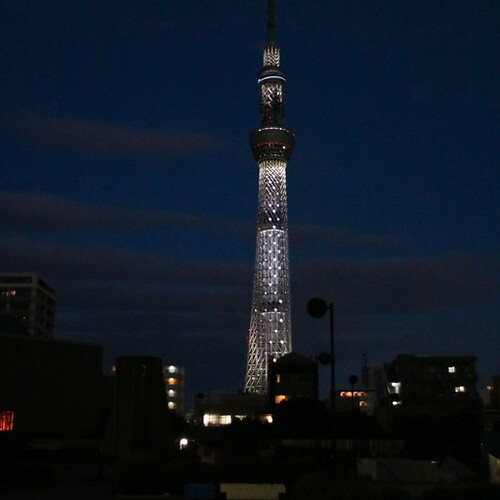 Also in Sumida and a 14 minute walk from the Asahi Beer Headquarter Building is the Tokyo Sky Tower. There is a cost to go up in the Sky Tower but it will offer greater views. No visit to Tokyo is complete without at least a peak at Akihabara. You can hop on a subway or walk. It is only a 40 minute walk from Sensoji temple. This is the center of anime, manga and electronics. It is busy and bright. 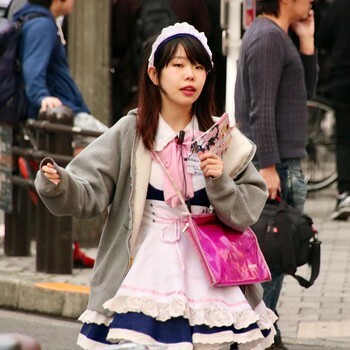 Expect to be offered a flyer for a maid cafe or an owl cafe on almost every corner. If you want to be called “master” you can grab a coffee in a maid cafe. I guess you would go to an owl cafe if you want to feel like Harry Potter? We spent our time browsing for electronics and people watching. 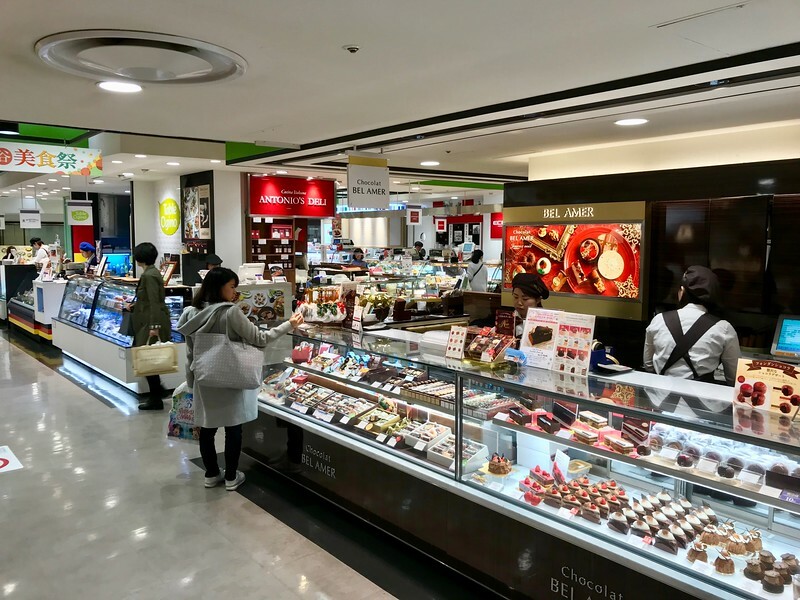 A great place to shop at least once while you are in Tokyo is a Don Quijote chain store for a Japanese shopping experience. This is a massive store that sells almost everything. The one in Akihabara also has a movie theatre. Just a 15 minute walk north of Akihabara is Ueno Park. 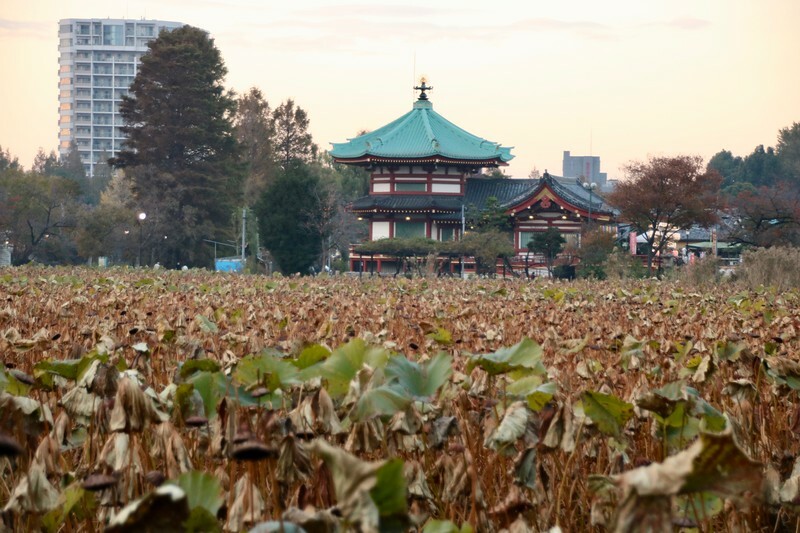 This is a large open park that will give you a break from the crowds and is also the home to the Kaneiji Temple as well as a number of museums. You can find the Tokyo National Museum, the Tokyo Metropolitan Art Museum, the National Museum for Western Art, and the National Science Museum in the park as well as the Ueno Zoo which is Japan’s oldest zoo. In Tokyo’ s harbor there are a number of man-made islands. One of them, Odaiba, has the feel of a permanent world’s fair. You can get to Odaiba by train or via a ferry from a spot on the river near Sensoji Temple. This museum was one of the best things we did in Tokyo. It is an interactive museum where artwork is being displayed on the walls but the artwork will change based on your presence or your touch. Waterfalls will flow around you, the kanji character for fire will burst into flame upon your touch. 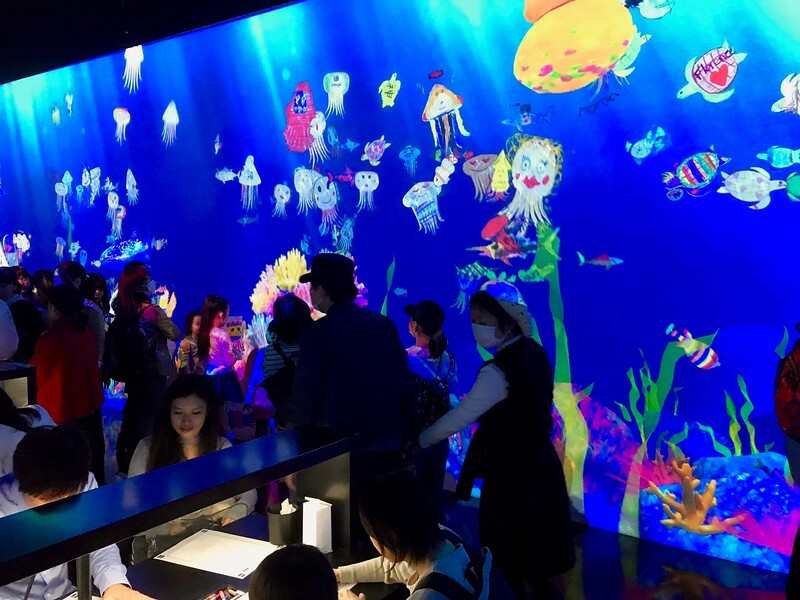 Kids (of all ages) can color in sea creatures and then watch them come to life and swim along the walls. 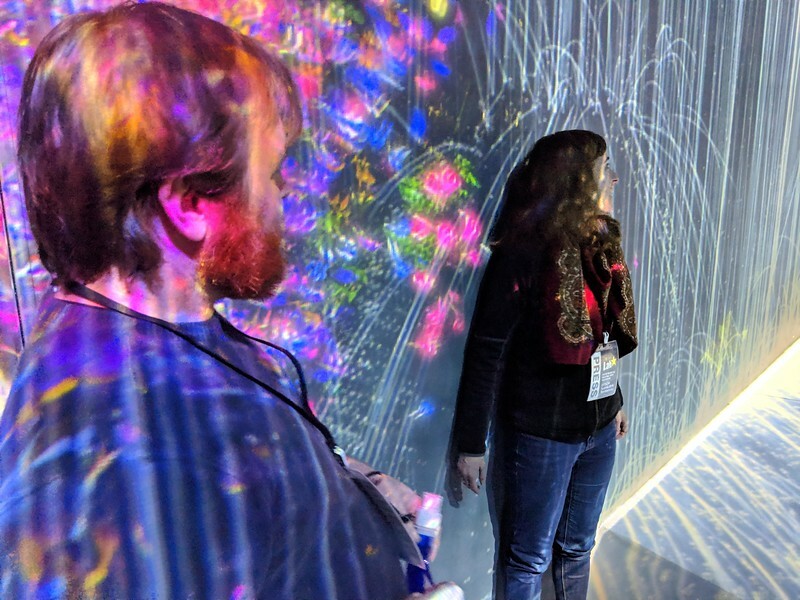 Read more about the Mori Building Digital Art Museum and see a video. 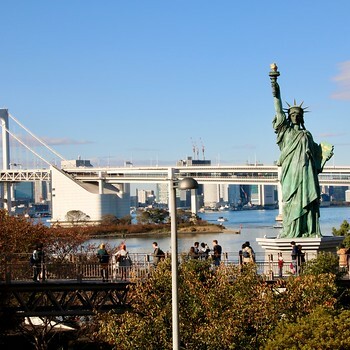 In Odaiba you will also find other hands on, non-stuffy museums like the Miraikan – The National Museum of Emerging Science and Innovation, the Tokyo Trick Art Museum, the Sony ExploraScience, and the Museum of Maritime Science. There is also a showcase for Toyota where you can test drive a car or see concept cars. 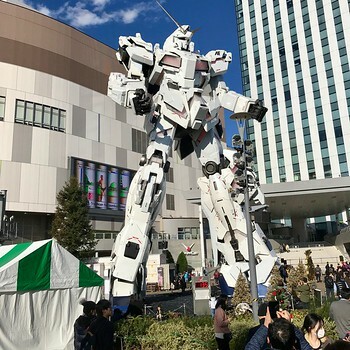 Odaiba also has a number of shopping malls, arcades and some great public art like this statue of a Gundam (giant fighting robot) and scale model of the Statue of Liberty. 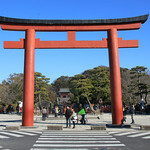 For additional days in Tokyo there are some optional activities and sites I would consider depending on your interest. 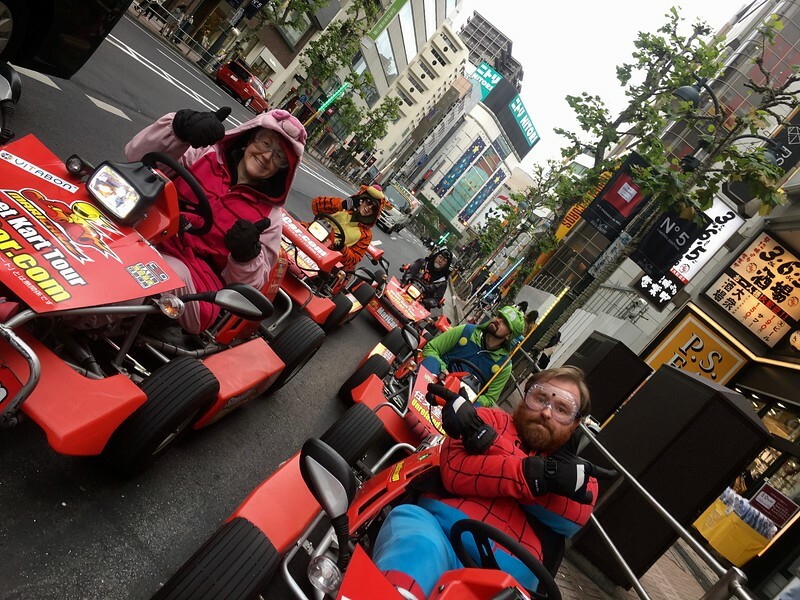 The silliest thing we did by far in Tokyo was dressing in costume and riding go karts through Tokyo traffic. You need an International Drivers Permit and you need to be able to follow the instructions of your guide, but it was a surprisingly great activity. We did it on the Sunday when traffic was lighter and lots of people were out who would wave at us or take pictures as we drove by. 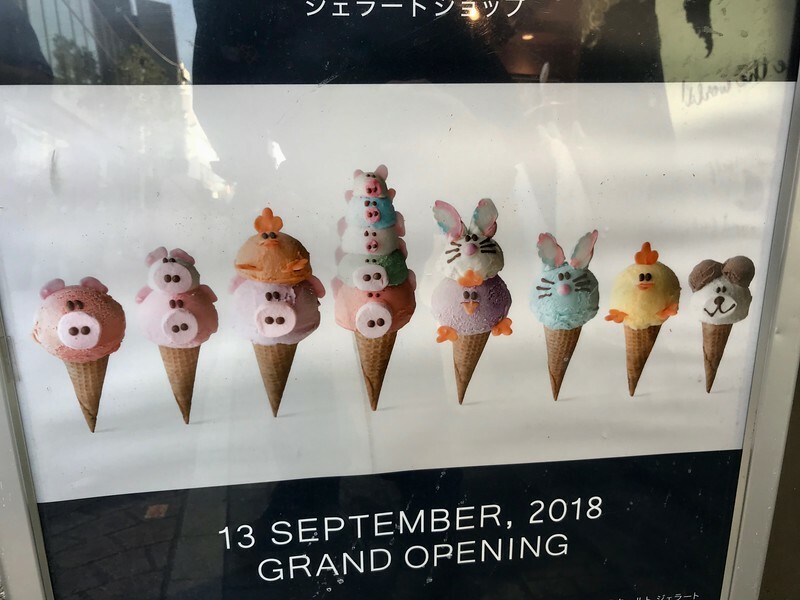 I have a video of the whole thing and more information at What to do in Tokyo in December. It should be a bit of a clue that I left the Imperial Palace for a 4th day in Tokyo. You may want to skip it altogether. Except for January 2 (New Year’s Greeting) and December 23 (Emperor’s Birthday) most of the palace is closed to the public. 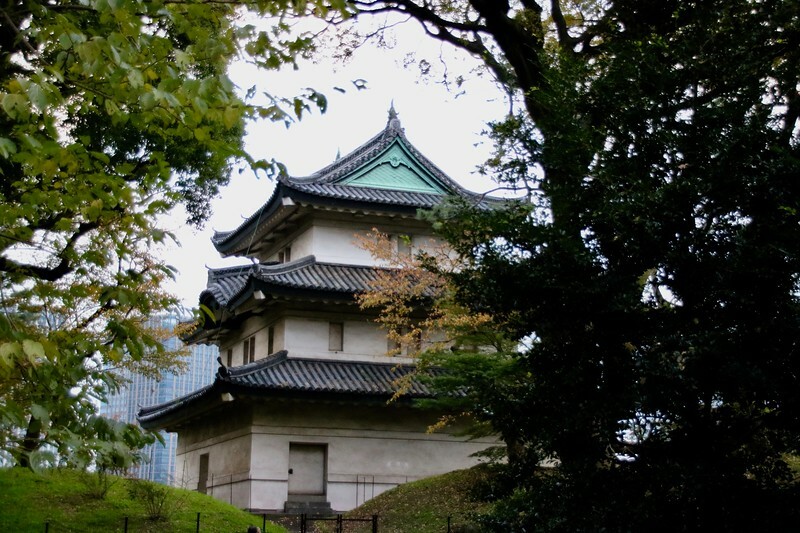 You can take a guided tour of the palace most days but you won’t enter any of the buildings so you might save your visit to a royal palace for Kyoto if you are going there later in your trip. Another option for your 4th day would be do a deep dive into Tokyo culture with a food tour or a cooking class. Ironically, If I had 5 days in Tokyo I would spend one day out of town. For me that would be a day trip to Kamakura which is easily accessible via local train, about an hour from the Tokyo station. 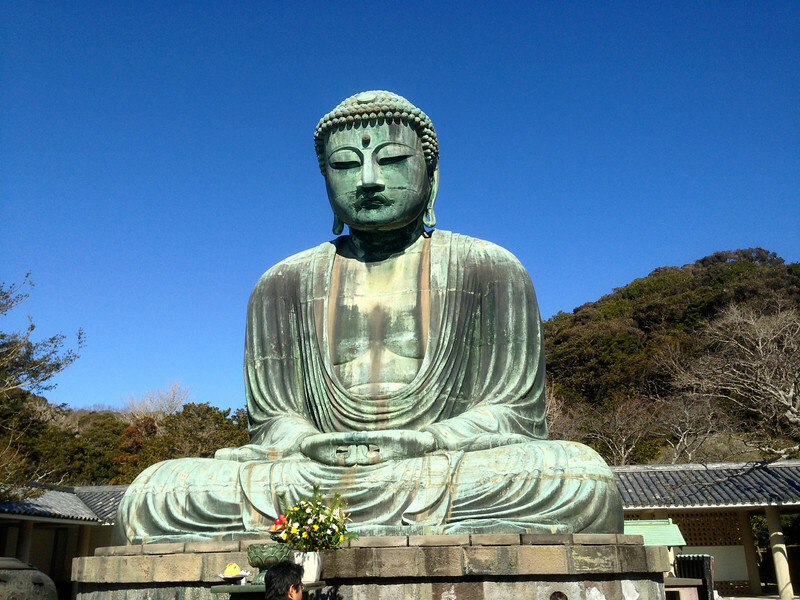 Kamakura is small today but was the countries largest city from 1200 to 1300 A.D. 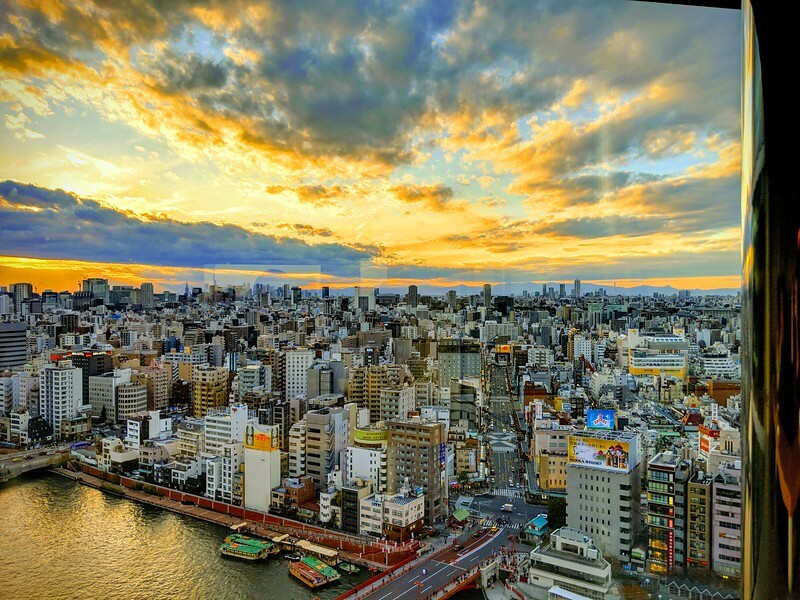 Here you will find some of the ancient history and UNESCO sites that Tokyo does not have including a giant Buddha dating back to 1252 A.D.
You can also find beaches, a shrine where people was money to make more of it as well as, surprise surprise, some shopping / dining streets. I would change the above schedule based on weather. 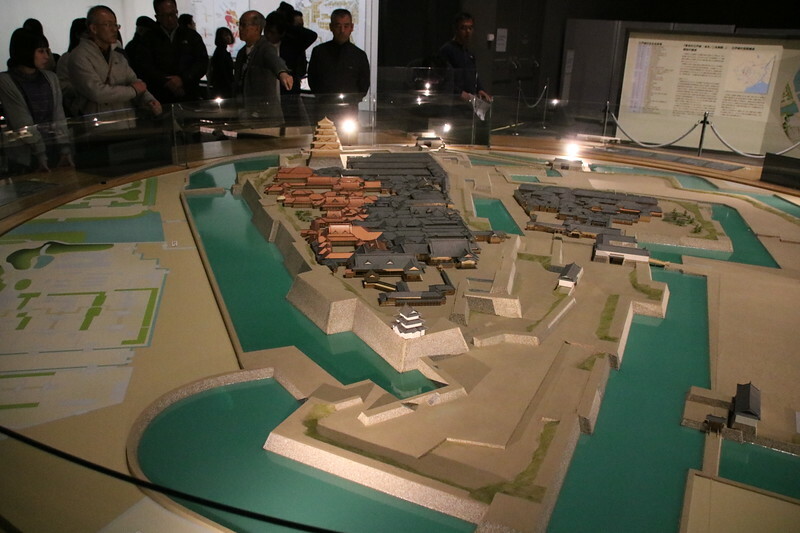 You could save Odaiba for a rainy day or the museums in Ueno Park (except the zoo), but history buffs might also consider a visit to the Edo Tokyo Museum to learn about the history of Tokyo from the Shogun time to the present. The museum is in Ryogoku next to Ryogoku station. I highly recommend taking a free tour with one of their docents.